Bernie Porter is a haunted man. He holds tight to the guilt that he was responsible for the death of the only one he’s ever loved, a man he vowed to protect and keep safe. 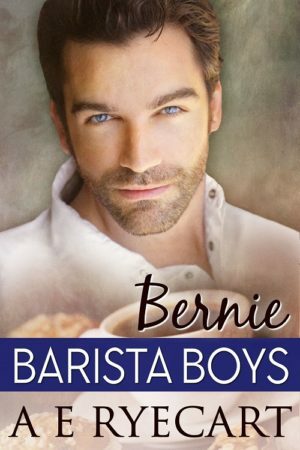 Every frightened and damaged kid who washes up at Barista Boys door, Bernie rescues each and every one – all because of the man he failed to save so many years before. Emotionally and physically scarred, Jared Hastings survived a night of violence and madness that almost left him dead. As he emerges from the nightmare that threatened to destroy him, Jared’s determined to plunge head-first into a future that’s free from the horrors of his past. A night-time street robbery, and Bernie and Jared are thrown into each other’s worlds. But as fast as Jared comes into Bernie’s life, he’s gone, leaving Bernie with the gnawing conviction he’s let something precious slip through his fingers. Their paths cross again in a way neither could have foreseen. From their first tentative steps, the slow burn of their relationship gathers pace. But as dark histories are revealed, and souls and hearts bared, each man finally comes to understand they can fix not just themselves, but each other. Review: Jarod and Bernie both have tragic pasts. They both come together and learn about the other as they traverse through their emotions. I liked they had each other and the cafe. It was depressing at times but they overcame that and flourished with the others help. I did not read books one through four myself. But this story flowed rather well despite that. Only a few times where I felt as though I was missing something, other than that it was a well written book with plenty of drama. Emotional and heartfelt: this story was a great read. Posted on November 20, 2017 November 20, 2017 by ShortyPosted in Book Review, MM Book Review, MM Romance Book Review, Reviews, Self PublishedTagged A.E. Ryecart, Barista Boys series, Gay Contemporary Romance, Gay Self Published, GLBT Contemporary Romance, GLBT Self Published, Shorty's Reviews.